relief to their equine partner. When Kevin Babington first laid eyes on Shorapur he knew there was something special about the mare. Despite being told she was too hot for his liking, he had to try her. That first ride was a year and a half ago. Yet, Friday they won the $25,000 SmartPak Grand Prix presented by Zoetis as if they'd been together forever. Redemption was the name of the game during the $2,500 USHJA National Hunter Derby, presented by Walgreens, the featured hunter class on July 25 during Horse Shows by the Bay Series IV. 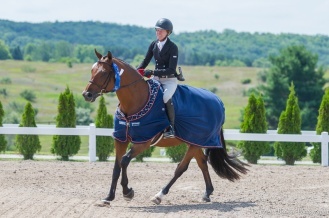 Molly Ashe and Kennzo had returned to the Traverse City show this year as the defending champions in the $25,000 USHJA International Hunter Derby, presented by The Gochman Family, held during Series III. An unfortunate rail in the Classic Hunter Round, however, cut short their time in the show ring that day. Some of the biggest players in the equestrian heart of Wellington, Florida, are investing heavily in a new resort in North Carolina.